The idea of “two” fascinates us. Cells duplicate, twins are born, mirror images speak a universal language, people couple, etc. Even more interesting is what lies in the space between two – what connects, integrates, repels. Both the fusion and tension that occur in those spaces are fertile ground for artistic interpretation. This exhibition examines the space between two through the medium of printmaking and takes many forms: prints, books, sculpture, textiles and video. Thirty-one artists explore themes of interpersonal relationships, time and space, metaphysical ideas, duality, nature and gender roles. 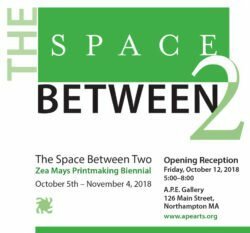 All of the artists in the exhibition are members of Zea Mays Printmaking, a studio in Florence with a focus on safe and sustainable printmaking practices. The studio provides workspace and equipment for etching, screen printing, relief, monotype and photo printmaking processes. Zea Mays Printmaking would like to dedicate this exhibition to the memory of Gordon Thorne, a stalwart supporter of our studio and artistic visionary.